In this 2 to 3 hour workshop you will learn the ingredients that you need to develop and engage your leadership of self and operate from your authentic SoulPath. It is a powerful and interactive experience with exercises and teachings, which will expand your heart and leave you yearning for more. You will leave knowing you are the unique and authentic gifted being this world is waiting for immersed in confidence and clarity. You will confirm your gifts and talents empowered in your divine uniqueness, while being actively ready to serve humanity with a bigger vision and more powerful presence. 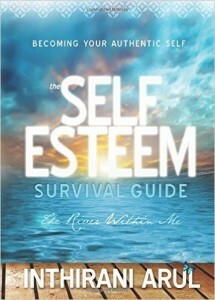 The self esteem survival guide is a book that shares a real life true story. It takes you through the ups and downs of relationships and the cycle that one experiences on an emotional level. We all start out as our authentic self and as things happen some people give away their power yet others overcome the obstacles and thrive. Being authentic means finding the key to happiness and success within one’s self. This book has real tools to help one identify the stages you may be going through and tips with “how to’s” to move forward. It shares with you that life is full of opportunities and that your life has a greater purpose for you regardless of what happened. This book will lead you back to your authentic self. Finding the key to happiness and success within and embracing your power.